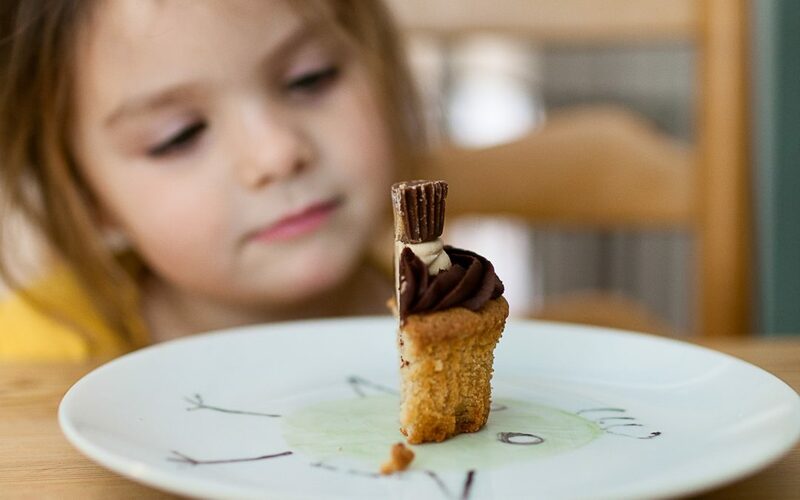 Savoring seems to be made for kids. It’s a joy watching them deeply focus on a food they love as they enjoy every last crumb or lick. They are masters of being in the moment! Try this activity to prompt savoring when they are in more of a gobbling mood. Whoever savors the longest wins the ‘reverse race.’ Go ahead and play with them! You can do this with any food but it can also be fun to start with a 1/2 or 1/4 portion of a favorite or indulgent item to demonstrate that savoring with attention can be so fulfilling that a smaller portion is satisfying. Set up that whoever savors their portion the longest wins. Share the prompts below to bring their attention to the nuances. Take two deep breaths before beginning. This increases calmness and attention. Look at and sniff the fragrance of the food before the first bite. This starts their savoring experience. Take a small nibble and hold it on their tongue. What is the taste, texture, temperature, size of this first little taste. Take another bite and continue to notice the details. Chew slowly and prolong each mouthful. Note how the flavor changes as the food particles get smaller. Try different ways of savoring – taking tiny nibbles vs. bigger bites with many chews. Hold the food on their tongue until it dissolves. Notice if there is flavor left after the last swallow. Who savored the longest? Share any observations!